Breakfast now included in the rate! Villas Sayulita, a small Mediterranean style hotel located on Sayulita's tranquil North end, offers 15 large and fully equipped suites. We have rooms with two double beds and rooms with a king size bed, including a pull out double bed. There are two large penthouses in Villas Sayulita, each of them have two cabins. One cabin with king size bed, tv room, kitchenette and bathroom the other cabin has a king size bed, fully equipped terrace. All rooms have AC, refrigerator, kitchenette, basic utensils for cooking, a terrace with a patio table set, and WiFi. Villas Sayulita has its own organic restaurant and smoothie bar where we offer breakfast and dinner in our beautiful organic garden. Our tucked away location allows you a quiet vacation surrounded with the beautiful lush Sayulita jungle and views of Monkey Mountain. When you are ready to leave our tranquil environment, the beach is only two blocks away, and the center of downtown Sayulita is a very easy stroll. This Sayulita hotel's large pool is a great place to spend the day. The swimming pool is surrounded by a beautiful garden, ample sunning area, and several shade palapas when it is time to come out of the sun. Our roof top sun deck is also a great place to enjoy the Sayulita sun and the beautiful surrounding jungle; it is also the perfect location for an evening cocktail as the sun sets. Villas Sayulita also has a holistic center and spa where pilates and yoga classes are held. We also offer sevices such as massages, reiki, kinesiology, and chi-gong and also we have one Temazcal (sweat lodge). ** The yoga studio is free of charge when booking more than 8 rooms. For the biking lovers we have a Pump Track (dirt ramps) designed by Chris Vandine - Pro biker. Our staff at Villa Sayulita is available 24 hours a day. We take special care to offer each guest personalized service. 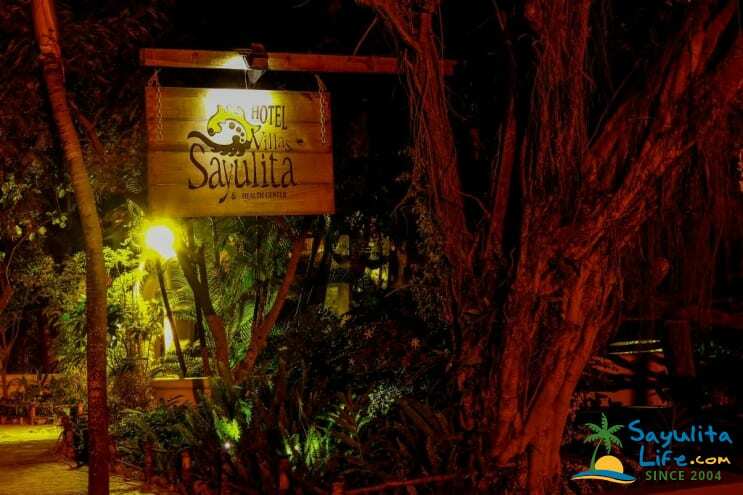 We are here to make your Sayulita vacation perfect by offering you a great Sayulita hotel. We had a great time during four weeks at Villas Sayulita. Enjoyed our hosts Salim and Sabrina and the beautiful backyard garden where delicious breakfast is served daily. We got a last minute booking, with a very nice room with a kitchen.My friend got very ill that last day, and the staff members were so very helpful in taking care of her. on a recent trip to Sayulita we booked a week at this hotel. When we arrived and were shown our room, it smelled so strongly of mold, that we could not stay there. My traveling companion has respiratory issues and could not have stayed in the room smelling so strongly of mold. We explained this to the manager and was told they would refund half of our deposit. We have been traveling to Sayulita for the past 8 years and this is the first bad experience we have encountered. The rooms were well appointed and clean. Great location away from the noise. A healthy walk to the beach. They have beach towels and other amenities for rental. Great food and Salvador was a gracious host! We went over Christmas break and stayed a week here and stayed in the penthouses. The breakfast was amazing and the servers were really nice! Salvador in the front office was very friendly and accommodating. The villas are walking distance from the town. The bathrooms in the penthouse are not in the rooms, they are a half floor down next to the main house. There is no TV in the tv room. There’s a hole in there for a tv but no actual tv. The other room had a tv but no service. One of the rooms had no microwave while the other one did. There is a step in the private room that we kept tripping on and hurting ourselves in. Seems like it could be dangerous. The pool is super cold and there isn’t really an area to hang out at around the pool area. I think the regular rooms are the way to go in this place. Those rooms looked really nice! We had 11 people so we figured the penthouses were the better way to go. I really can’t rave enough about Salvador and the couple who own the little black lab. The other front desk guy was not very personable. All in all we still had a good time, I just feel for the money we didn’t get what we paid for. We stayed here for a week in March and were very pleased with our room and lovely breakfast. The small pool was surprisingly quiet and felt like a tropical oasis. The staff here were very helpful and friendly. We would recommend this hotel for budget conscious couples and families. Great staff! Good breakfasts! clean and quiet. Awesome location. If your a family that doesn't spend much time in your room this is all you need. Looking to book for March 2018 right now. hope it all works out!! Hi Graham, thanks for your preference and see you in march. For sure be a pleassure host again. The hotel was perfect for our surfing vacation. It was out of the noise and hustle of downtown and extremely quiet. The pool was a perfect way to unwind after a day at the beach. The accommodations were clean and efficient. The staff was sooo pleasant and helpful. The breakfasts were absolutely delicious in the secret garden. I highly recommend staying here. For $100 a night it's OK. Rooms and property are relatively clean and kept up. Pool is cold, which is great after a hot day in the sun. Expect rock hard beds. Kitchen is sparsely equipped, it may take a couple of trips to the office to gather up the basics. Housekeeping staff are great. Yoga was very well done, Jayne is awesome. Nothing fancy, but a clean place to park yourself while enjoying the area. Suggest you pay for any extras each day so there are no surprises at check out. Had a couple of negatives with management, so will spend my money elsewhere next year. We are sorry about any misunderstanding. We have sent you an email to see if we can rectify the situation for you. I wanted to move in. This place is the perfect sized accommodation to have just the right amount of facilities without feeling like you are in a resort/large hotel, ie. the experience still feels intimate and personal. The landscaping is well done, and a great pool, outdoor garden, compost toilets in the garden too so extra brownie eco points, a sweat lodge, open yoga palapa, hammock, smoothiebreakfast bar, bike and golf cart rentals, and more... rooms were nice, good water pressure, and kitchenettes. This would be an ideal place for groups or large families.. they also have a yoga studio and it's 1 block from the beach.. amazing. Loved it. I will be back! We also have 2 penthouses, It costs $ 230 usd per night and is for a maximum of 6 people. Breakfast is included.